A Case Report of Chyluria with Proteinuria - Filarial origin? An enigma. Abstract Filarial infections are common in most tropical and subtropical regions of the world. We report a case of chyluria due to lymphourinary fistula in a filarial antigen negative case, the diagnosis of which was confirmed by the demonstration of microfilariae in urine as well as in peripheral blood only after diethyl carbamazine (DEC) provocation test. So In endemic areas, workup of filarial infection should be considered in a patient with chyluria even if the filarial antigen is non-reactive and microfilaria cannot be demonstrated initially. Filarial infections are common in most tropical and subtropical regions of the world. Numerically, the public health problem of lymphatic filariasis is greatest in India, China and Indonesia . Lymphatic filariasis is caused by Wuchereria bancrofti, Brugia malayi, or Brugia timori. The clinical manifestations are directly related to the occlusion of the lymphatic channels, thereby causing lymphangiectasia . The most common presentations of lymphatic filariasis are subclinical microfilaremia, acute adenolymphangitis, hydrocele ,and chronic lymphatic disease. We report a case of chyluria due to lymphourinary fistula in a filarial antigen negative case, the diagnosis of which was confirmed by the demonstration of microfilariae in urine as well as in peripheral blood only after diethyl carbamazine (DEC) provocation test. A 32 year male (Figure 1), non-diabetic, non-hypertensive, carpenter by occupation came from Burdwan district of West Bengal, presented with increased frequency of micturition with milky white urine for last 6 months. It was associated with pain in the hypogastrium and significant weight loss. There was no h/o fever or burning sensation in urine, nausea, vomiting, headache, swelling of the limbs or swelling anywhere in the body. Appetite was normal. No h/o cough, hemoptysis or trauma to the abdomen. There was history of vague itching over different part of the body with redness which used to disappear on its own without any significant medication. Figure 1. Patient with observable cachexia. Investigation showed no pallor, no leucocytosis with preserved ESR. Absolute Eosinophil count was 210/cmm of blood. Renal function test and LFT was otherwise normal (albumin was low, 2.2 g/dl). Urine examination revealed proteinuria (3+), RBC (6-8/HPF) and pus cells with fat globules. Urine for AFB was not found & culture showed no growth. Urinary triglyceride level was high (169mg/dl) & occult blood was strongly positive. USG abdomen showed layered echogenic sediment in the lumen of bladder. St xray chest & CT abdomen were within normal limits. Serum uric acid and PSA were normal. Serum triglyceride was 158 mg/dl. Mantoux test was negative. Filarial antigen test/ W. bancrofti antigen was non-reactive. The peripheral blood film or urine did not reveal any microfilaria. 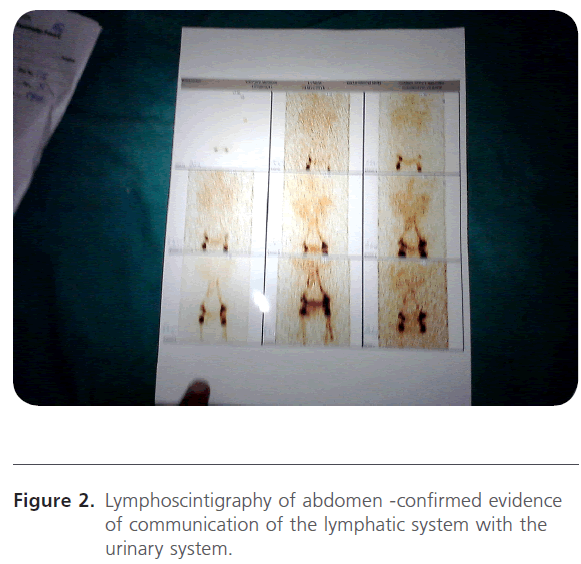 Figure 2: Lymphoscintigraphy of abdomen -confirmed evidence of communication of the lymphatic system with the urinary system. 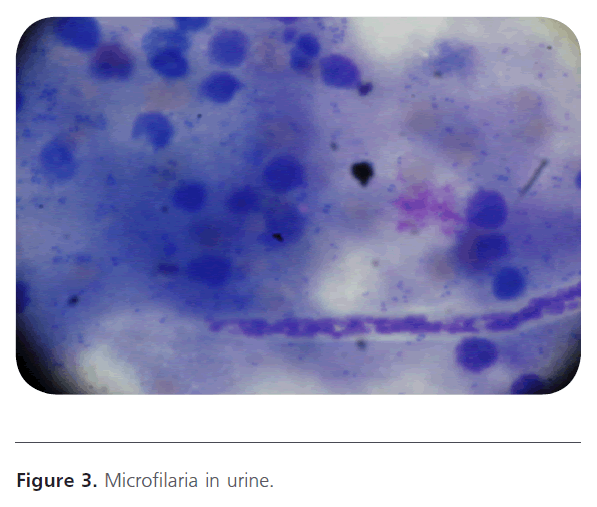 Figure 3: Microfilaria in urine. 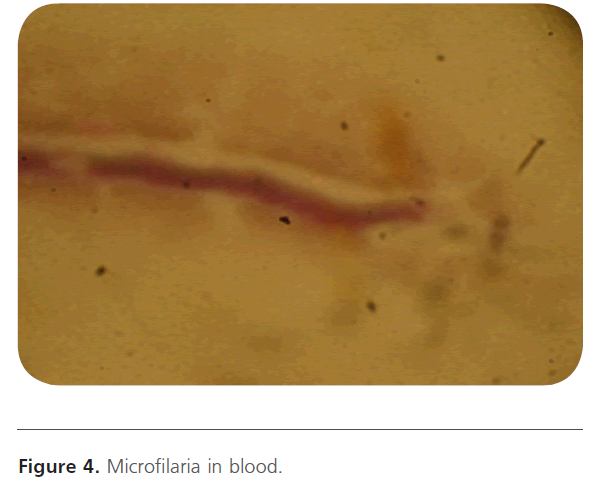 Figure 4: Microfilaria in blood. 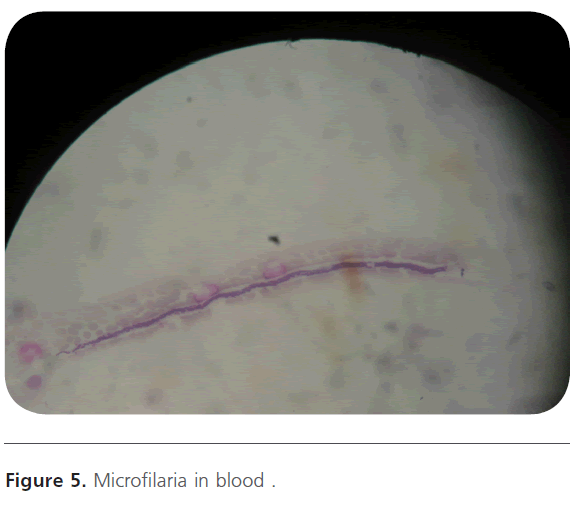 Figure 5: Microfilaria in blood . As there was no improvement of chyluria, the patient was sent to urology department and they had operated and closed the communication. Patient became symptomatically better with control of chyluria and was discharged with albendazole for 2 weeks. In the endemic areas, up to 10% may be afflicted by filariasis .Chyluria is a state of chronic lymphourinary reflux via fistulous communications secondary to lymphatic stasis caused by obstruction of the lymphatic flow. Chyluria occurs only in 2% of filarial afflicted patients in the filarial belt. If the obstruction is between the intestinal lacteals and thoracic duct, the resulting cavernous malformation opens into the urinary system forming a lymphourinary fistula. Once such a fistula is formed, intermittent or continuous chyluria occurs. In our patient, chyluria was the chief complaint and hematuria due to rupture of minute blood vessels at the fistulous site, weight loss, malnutrition cachexia (Figure 1) were also present. Loss of proteins in urine may add to the malnutrition. Microfilaria positivity in urine has been variously reported as 40- 75%  & could not be demonstrated in our patient at first but DEC provocation test is 80% as efficacious in demonstrating microfilaremia and that’s why it was detected after DEC therapy. The lipid contents of chyluria are mainly chylomicrons, 90% content of which is in the form of triglycerides as in our patient. The whole blood immunochromatographic card test (ICT card test) to detect filarial antigen has shown several advantages when compared to thick blood film. The sensitivity of the ICT card test is 94.7% and in the endemic area, the possible range of the specificity is from 72.4% to 100% . Our patient was a case of antigen negative filariasis. More studies evaluating the performance of the whole blood card test are necessary to verify indices of accuracy under different diagnostic criteria, for instance, considering faint lines either as a positive or negative result. It would be useful if the manufacturers could give more specific details about the method and antigen applied in the test, as well as further information related to the correct interpretation of the tests in the case of extremely faint lines. The management of cases of chyluria includes bed rest, high protein diet, drug treatment (diethycarbamazine) and use of abdominal binders, which is claimed to prevent the lymphourinary reflux by increasing the intra-abdominal pressure. Clearance of microfilara by DEC therapy did not appear to reverse the type of lymphatic pathology observed in microfilaraemic subject . Surgical management is indicated in cases of recurrent clot-colic, retention of urine and progressive weight loss despite conservative treatment, especially in children. The cornerstone of management of chyluria is renal pelvic instillation sclerotherapy. Surgical alternatives include open or laparoscopic chylolymphatic disconnection. 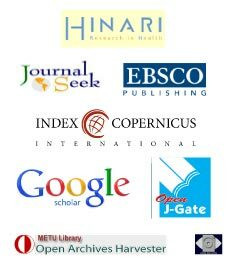 The authors declare that there is no competing interests exist. Seth A (2009) Microfilaruria in a patient of intermittent chyluria. J Cytol 26:151-52. Szuba A, Rockson SG (1998) Lymphedema, Classification, diagnosis and therapy. Vascular Med 3:145–56. Fauci AS, Braunwald E, Isselbacher KJ, Wilson JD, Martin JB, Kasper DL (2001)In:Harrison’s Principles of Internal Medicine. 15th ed. New York: McGraw Hill.1238. Diamond E, Schapira HE (1985) Chyluria-a review of the literature. Urology 26:427-31. Kohli V, Gulati S, Kumar L (1984) Filarial chyluria .Indian Pediatric 31: 451-54. Braga C, Dourado MI, Ximenes RA, Alves L, Brayner F, Rocha A, Alexander N. (2003)Field evaluation of the whole blood immunochromatographic test for rapid bancroftianfilariasis diagnosis in the northeast of Brazil. Rev Inst Med Trop Sao Paulo 45(3):125-9p. Dissanayake S, Watawana L, Willy F. Piessens( 1995) Lymphatic pathology in Wuchereriabancroftimicrofilaraemic infections .Transactions of the Royal Society of Tropical Medicine and Hygiene: 89, 517-521p.